Three massive prestressed concrete supports for a road bridge were dismantled under great time pressure near Osnabrück. The railway track under the bridge was shut to rail traffic for two nights. Crane contractors Sommer-Kranverleih from Bremen and Autokrane-Spallek from Ibbenbüren each brought an LTM 1300-6.2 to the site to complete the job. The demolition team had just two nights available to remove the massive prestressed concrete supports. 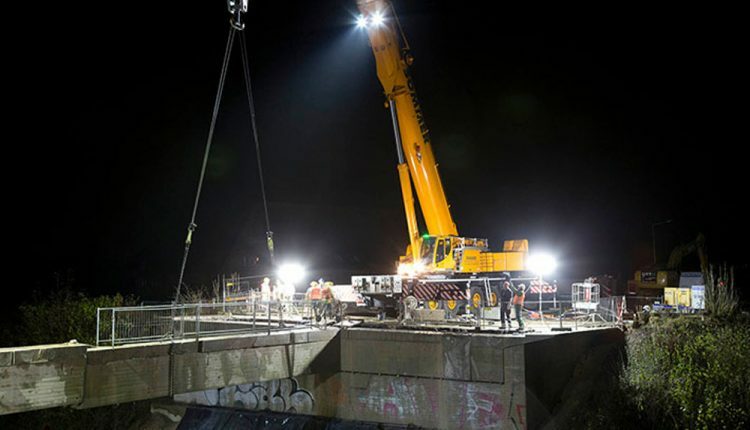 A Liebherr mobile crane was positioned on both sides of the railway track around eight metres below the bridge. The cranes’ attachment equipment was secured to each half of the 80 tonne concrete supports before the supports were then sawn through in the centre and at the abutments. It took around four hours for the diamond-tipped wall saw to cut through the concrete supports which measured around two metres in height. The crane drivers then had to work with great precision because they had to make sure that the freely suspended sections of the support, measuring around 15 metres in length, did not tilt. The two 300-tonne cranes managed the load of around 42 tonnes with a radius of around 15 metres. Below-zero temperatures and at times extremely thick fog made work on the site difficult and uncomfortable. During the first night, the team only managed to remove one of the supports rather than the two that they had hoped for. On the following night, however, the two remaining concrete supports had been removed by the morning and rail traffic could be restarted as planned. The two crane contractors, Sommer-Kranverleih and Autokrane-Spallek, worked together for the first time on this site. “Our collaboration went very well”, confirmed Managing Director Jörg Sommer after the work had been completed. Sommer, based in the Hanseatic city of Bremen, and Spallek, which operates from Ibbenbüren in the State of North Rhine-Westphalia, are long term Liebherr partners. Their fleets each comprise around a dozen cranes, all of which have been supplied by the Liebherr Plant in Ehingen.